I have a few different skis, all different shapes. How well does a small race ski sit in the powder ski rack? Our Powder Ski stand should work fine for your race skis. As long as the stand is sitting on a level surface, the skis should stand up no problem. Does this rack work with tail rockered twin tip skis? 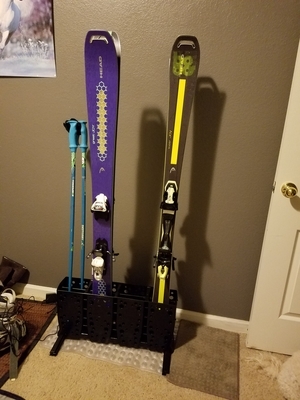 Would my 6 year olds skis also fit in the powder rack? Your tail rockered twin-tips should be fine in this powder ski stand - you will probably need to use a ski band with them, and the would need to otherwise fit the dimensions of the stand, with their tail being no more than 140 mm wide. Children's skis shouldn't be a problem in the larger stand. Will thinner skis stand up properly in this ski rack – have both types. Smaller/thinner skis work fine in the powder ski rack - so you should be able to use it for both types of skis. I have Rossignol S7 Skis. Will they fit in this rack - they have a twin tip? Some twin-tip skis can work in this powder ski stand - but we actually can't guarantee yours will. The tail will still need to be no more than 140 mm wide, and you would most likely need to use ski bands to keep them stable in the stand; if so, they might work fine in this stand. Does this free-standing rack accommodate twin-tail skis? The "flare" at the tail is 2 to 2-1/2". Unfortunately, our powder ski stand doesn't accommodate skis that have up-turn or flares over about 2 & 3/8th inches, which is just a tad smaller than your twin-tail skis, but they wouldn't fit. Written by: P gardiner D.
Just what we needed. We do not have room for hanging more ski's on the wall. This can sit in front of a window and gives us added convenient ski storage for guests. Works perfectly, better than we expected, used to rack our Lithic Demo skis, Excellent, Highly recommend! Very happy with the purchase of this. It's cool to have a rack just inside my apartment for when I walk in with my skis. I live in a ski in, ski out apartment in Colorado. Only downside is it's super light so when you only have one pair of skis in it, it comes off the ground when taking it out. Overall, very happy with it. I was a little concerned about the stability of this product but once i assembled it (60 seconds) and put several sets of skis in it, my concern was eliminated. Its exactly what I was looking for - a dry, convenient and versatile place to put our skis when we get home from the slopes and take the skis off the car. In the winter I'll keep it right next to the car / garage door; at the end of the season I'll move it and the skis to the storage room where they will be safe, dry and out of the way. Prompt shipping, reasonable price and works just fine with my Rossi 88’s and 98’s ... who could ask for more! Thanks! This item seems a little unsteady but I think it will work, I’m am glad I bought it. Works perfect and clicked together in less that 1 minute! Thanks! Love this ski rack which is compact and portable. It is sturdy enough and just what we needed. It seems to me that this product (free standing 'powder' ski rack) is way overpriced at $75. It's made of lightweight molded plastic and the feet slip slide all over the place because there is nothing provided to keep them fixed in place. Guess I will have to glue them...? Can't figure out why it is designed this way. I do like the fact that it doesn't have to be mounted, but come on folks, how 'bout something heavy duty with firm feet at that price point. I thought I would be buying something much sturdier. #1, watch the video for easy assembly instructions. My package had no instructions in it, but it's kind of a no-brainer assembly. #2, I bought the larger sized one. Great for my powder skis, my all-mountains, and it also holds my racing snowshoes (Crescent brand). They're narrow at the back and fit right in. Not sure standard snowshoes would fit; you'd have to measure. Just as advertised. On time and perfect condition. This is a perfect way to store up to four pairs of skis and poles. Took less than a minute to assemble and keeps the skis out of the way of any other sports gear. Also, you can move it off-season to another part of your garage so it's not in your way. Well made. Does exactly what it is supposed to do, hold skis. My powder ski rack arrived quicker than expected. Assembly was a snap and my wider powder boards fit perfectly and are very stable in the rack. Price was right and I will look to StoreYourBoard for future needs. Got just what I was expecting. High quality and simple to put together. I purchased a skateboard rack previously both have exceeded expectations. Nice having free standing ski rack works great. Sorry, but skis are not snug and therefore not stable. There is just enough sway that the skis could cause the rack to tip or at least hit the wall that I had placed next to. Skis that I tried were the Volkl Mantra 118 at tail, the Fischer Watea 118 at tail, and the Fischer Watea 107 at tail. Have to admit the rack was quick to set up. Nice and sturdy for our big boards; easy set up too! The rack was completely assembled and ready to use. I had my 4 sets of skis in the rack minutes after it was delivered. There is so much room in the slots my poles fit in the rack too! Best rack ever. Snow drains on floor and easy in and out and very stable. It took longer opening the box then assembly. Skis fit great and no hassle mounting on a wall. We are short on storage space and needed to store two pairs of powder skis and two pairs of regular skis without damaging our old plaster walls. This rack is perfect for our needs! It is just the right size-- big enough for the skis without being bulky. The skis are well supported by the rack if you use a band around the top of the ski. I'd add that the customer service was great as well. I'm already shopping at StoreYourBoard for my next gear storage solution. I have been working on organizing a room I call our sports room. In the past I had a ski rack that hung on the wall. It seemed the skis always ended up leaned up against the wall instead of hanging. I believe that this free standing ski rack will help with the chaos. It is heavy duty plastic and very stable. Fits our wide powder skis great. We want to purchase a regular one for our all terrain skinner skis as well. Great product! Sure beats standing them up against the wall in a home-made rack.